We kicked off the day with some fresh content marketing ideas. Kelsey’s presentation mainly focused on ways to leverage existing content and either spin it or repurpose it into different formats or social networks. Some of the tips were things we should all know (guest blog, syndicate content, etc. ), but there were a lot of good ideas for other channels. Slideshare, for example, was mentioned a lot as a new way to present existing content to a different audience. Podcasts surprisingly make up almost 26% of all audio consumed (that’s across all media devices including cars), which is an astounding number. Sometimes, it’s worth altering the format of your information since people prefer different consumption behaviors (e.g. the Oregon DMV offers an audio version of their driving manual). You can also turn long-form written content into short-form podcasts. One example was Frommer’s (known for their travel guides) creating short bite-sized podcast episodes focusing on very specific locations within a country. For videos, there were also a few ideas. For example, NewEgg creates videos for breaking news stories, which is often quicker than writing them up. This allows them to be first to publish, and then they turn the content into longer, written posts. Lastly, one metric Kelsey touched upon was that syndicating content elsewhere can lead to an 180% increase in email subscribers. The logic here is that if a new audience sees your content, they’ll seek out the author or company who puts it out (assuming the content is worthwhile). Peter Shankman’s presentation was more free-form, with no deck. It was focused on customer service in the digital world, and if there was one major takeaway, it was that you don’t need to be the best at customer service; you only need to be “several levels above crap.” The point being most companies are terrible at social media and online service, so you only need to be better than they are. One recurring theme of the summit was about the usefulness of social media metrics, or lack thereof. Peter postulated that the idea of big brands chasing social media Follows, Friends, Fans and Likes is going away because it doesn’t follow natural human behavior, and they aren’t useful to report on. People want to interact with people they know, and not necessarily with brands. He also mentioned that Yelp was dead (or soon to be) because other social networks are more useful for recommendations. I took issue with this one, because like I’ve written about two years ago, Yelp is a social network. Peter provided his four rules for better customer communications. Rule #1 was to be transparent. It’s inevitable that screwups will happen. Brands should own up to them, rather than trying to sweep them under the rug. Using a real life example, he said we should aspire to be like Eliot Spitzer (he apologized and is now accepted back in the mainstream) and not to be Anthony Weiner (who tried desperately for damage control). [sic] in my Tweet of Weiner’s name, by the way. A great quote from Peter was that “the best lover is a former hater”, meaning if you can turn someone around, they will become your greatest brand advocate. Rule #2 is to find out how your audience wants to receive information and deliver it to them that way. He told a story about a company that gave thank you gifts in the form of a coffee table book, but through a simple survey, he helped them figure out that the majority of customers preferred online content. So with that simple change, they not only saved money on printing books, but also increased their rate of donations. Rule #3 is to focus on brevity. Brands have an average of 2.7 seconds to reach their audience. After that, their attention will be gone. Peter advised anyone involved with corporate communications to take an improv class, as it will positively affect the way they speak, and help you get to the point. Rule #4 is to talk to people even when you don’t need anything. Sometimes it just pays to be top of mind. Peter told us the story of Barry Diller, a former CEO of Paramount during the 70s and 80s. One of his keys to success was to call people just to speak to them and ask if they needed help with anything, rather than just calling when he needed a favor. In turn, under his watch, Paramount became the most successful motion picture house of its time. “Yelp’s dead. Social networks are more useful for recommendations.” –@PeterShankman #SEJsummit #Searchmetrics But Yelp IS a social network..
Usually at marketing conferences, there are only one or two presentations that have super clearly defined actionable takeaways. 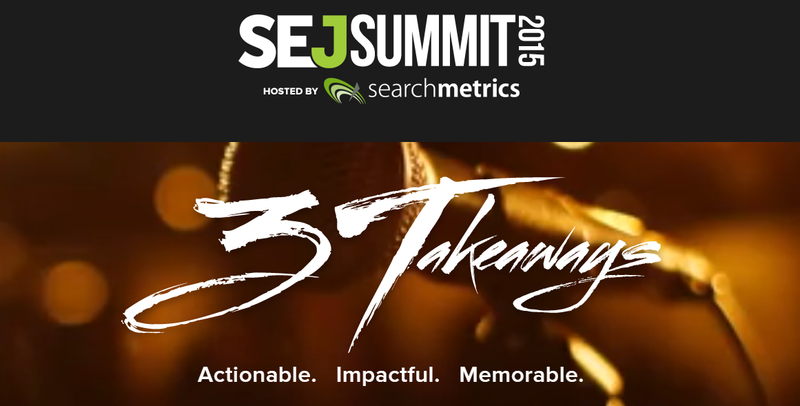 Luckily, SEJSummit had three of them (in a row!). The first was from Daniel Morrison, who was a quant through and through. I took the most notes from his presentation, which focused on leveraging psychographics to enrich your remarketing data/lists. Nurture/convert them with remarketing/RLSA (remarketing lists for search ads). In order to create the best personas, Daniel recommended layering in active intent filters (the types of people specifically looking to do something, which directly/indirectly ties to a conversion for your brand) as well as taking a dual root approach (creating target segments based on multiple criteria, such as behavior and financial qualifiers). He also recommended tagging campaign URLs with UTM codes so they can feed into remarketing list rules. He provided three real-world examples of successful campaigns. The first was a tire reseller who increased sales by 22% by bidding higher for users who had previously visited the homepage. The second was a vacation tour company that increased conversation rates by 300% by bidding on broad “gift” terms on people who had previously made a purchase. And the last was a telecom company (with TV, voice and internet services) who decreased CPO by 66% by serving custom ad copy based on the services that the users subscribed to. There was also talk of setting frequency caps based on the type of service and the typical life cycle, but I’ll touch upon that at the end of the next recap. Larry Kim is the founder of WordStream, and I’ve had the fortune of listening in on one of his webinars before. His presentation at SEJSummit was full of hyperbole, but his conviction to and expertise in the topic was something to behold. According to Larry, identity-based PPC marketing was the biggest evolution in both paid search and email marketing. Simply put, identity-based marketing (or people-based marketing) is the ability to target specific users by some sort of unique identifier (email address, phone number, Twitter handle, etc.). By targeting groups of curated individuals, you avoid some of the pitfalls of traditional PPC and email marketing efforts. Firstly, there are no inventory constraints as there are with email blasts, and it is harder to unsubscribe because targeted paid ads are just about everywhere (not sure if this is good or bad for the consumer…). Secondly, it makes it easier to increase your potential target pools while maintaining quality, as you can clone your audience lists using tools like Facebook’s lookalike audiences. Larry also brought up some real-world examples of his. In one instance, he blogged about a topic on a Friday afternoon and didn’t expect much press coverage. So he ran a Twitter campaign aimed at target influencers, and it was picked up by a large publication shortly thereafter. Another example was for a conference at which he was presenting. He created an audience list based on people in the location of the event within the relevant industry. During the Q&A session, an audience member asked Larry and Daniel about frequency caps. Larry advised that marketers be aggressive with caps as they are rarely met. And in cases where ad fatigue occurs (which means fewer clicks), the corollary is that the conversion rate for users who actually click through actually increases. “Hard to unsubscribe from identity based ads & no inventory restraints.” –@LarryKim #SEJsummit #Searchmetrics #SEM #PPC Is this good or bad? I briefly worked with John when he was my ABC News client toward the end of my time at Morpheus Media. He’s an opinionated and clever guy, and his presentation was focused on optimizing websites for mobile. In it, he dispelled some misconceptions about mobile best practices. The major one was that responsive design is not always the most mobile-friendly solution for large sites. Google did not outright say that responsive is the best; they only stated that responsive is better than a strictly desktop experience. The most common alternative is a dedicated mobile site (e.g. m-dot), which leads to all sorts of organizational content issues. The third way is dynamic serving, which displays different HTML/CSS based on user agent. The main benefit is page load speed. John stated that 80-90% of site speed issues are on the front-end, and now that load time is a mobile ranking factor, it makes the most sense to start there. Another stat he quoted was to aim for a 1 second page load for all mobile content above the fold. If optimized rendering can be utilized to allow that content to load first, it is preferable. John also mentioned that Google will start penalizing app download interstitials (on-page popups on mobile sites that ask the prompt users to download the site’s app instead). The best practice here is to use banners instead. For the future, it’s not outside the realm of possibility (and may actually be very likely) that Google’s stance will extend to all sorts of mobile interstitials and popups, regardless of intent. One last useful bit of information was about the purpose of googlebot-mobile. It is not the standard mobile crawler. Instead, it is the crawler that Google uses for “feature phones”, which were the precursor to smartphones (think slide or flip phones with limited internet browsers). The standard Googlebot is that one that crawls for mobile. Admittedly, this is the point of the summit where my attention was split between the presentations and some urgent client work, so my notes became a bit sparse. AJ of Ayima spoke about SEO reporting for enterprise clients. He championed graphical interpretations of data, rather than tabular formats. He also recommended utilizing some sort of “EKG” dashboard in order to monitor site health preemptively, instead of waiting for Google Search Console/Webmaster Tools to identify issues because at that point, the problem will have existed for days, if not weeks. In order to do this, AJ mentioned a few methods of early detection. One would be to look at the status codes that your website is returning. If an increase in 404s occurs, it may reflect a redirect problem. Another would be to look at a server log of which pages Googlebot is crawling. Your tech team is your friend for all of these things. AJ also echoed an approach that I’d heard before at the last SEO meetup I attended, which was to optimize for metrics that will get your clients (or their bosses) promoted. Those are likely the most effective KPIs for your agency work. Jordan spoke about how to choose content topics, leverage competitive insights, and about the importance of content recall. On content topics: brands and agencies often have tunnel vision when it comes to keywords. Brands should embrace the image that they’ve cultivated instead of trying to redefine themselves in a way that runs counter to how searchers view them. The websites that brands view as competitors may not be the same ones that are actual competitors. One example was Toyota. Their search competitor for a lot of terms isn’t GM, it’s local Toyota dealerships. Once they added “Official” to all of their site page titles, SEO traffic increased 20%. Content recall is also important. The topics or themes to which users associate your brand are hard to shake, and may not exactly sync up with your goals. For example, eBay has tried to become a marketplace for luxury goods, but users continue to associate the site with a secondhand garage sale image. One random and interesting stat – there are more used/broken phones of any single iPhone model for sale on eBay than listings for all new phones combined. Eric’s presentation was mainly about measuring for SEO successes. Without quantification of goals, any content creation is worthless. Eric’s recipe for content marketing success is to build you reputation, grow visibility, grow your audience, and get links. By measuring your own successes and comparing to your competitors, it becomes easier to identify which areas need improvement in order to overtake them in organic rankings. For example, a site that recently outranked yours may have recently acquired a high authority link. Your goal should be to receive a link of similar equity, if not more. Rankings are incremental; you should be trying to leapfrog over the listing directly above you, rather than aiming for #1 every time. Eric recommended using Open Site Explorer, Majestic SEO and ahrefs for backlink reporting.